Curious about 360/VR production? Ben Kidd tells us the creative/production process behind the Nissan Drives LeMans 360, a benchmark VR driving experience created by Hamilton+Kidd. They combined 360 racetrack footage with After Effects text and graphics, for a branded driving experience for racing fans. It’s one of the most popular youtube VR experiences of 2016, and Samsung highlighted it as one of their first selections for Gear Indie. With virtual reality and HMDs really gaining momentum, 360 video and immersive media has seen a huge boost towards mainstream relevance. Agility and access to tools is key for successfully leveraging new technology…especially for creatives. Tom and I knew the timing was right to get on board, so we obtained a 360 camera rig and spoke to Nissan’s YouTube channel Nismo.tv about their team motorsport coverage. Very quickly we realised an opportunity to give motorsport fans a new perspective of the legendary Le Mans 24hr race! Hamilton+Kidd has a lot of experience creating motion graphics and CGI animation for global brands. Adobe Creative Cloud is central to all our projects, it’s a natural choice for motion graphics, but even with CGI animation rendered from 3D packages, we would say that at least 50% of the final image quality comes from the ability to tweak and perfect the render in After Effects. 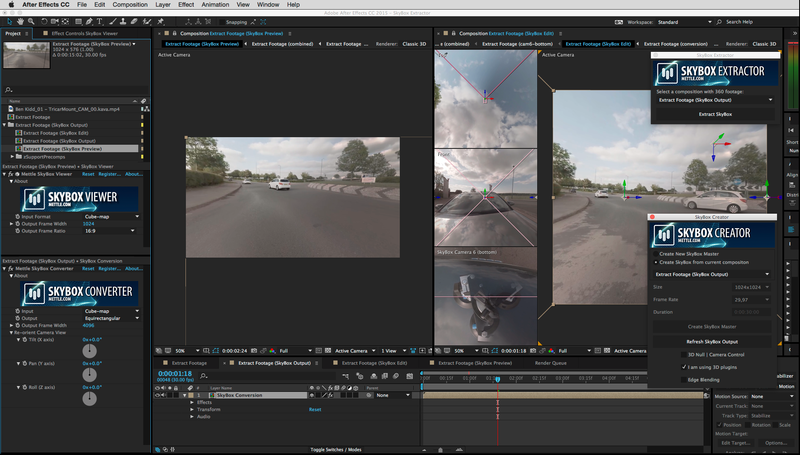 360 video requires a specific post production workflow. Once the 6 GoPro cameras were stitched, the creative work began. Back from the shoot in France, we had two MAJOR problems to overcome A: We had a speed restriction on track of 60mph B: It was raining and very poor light. This meant some serious post production was needed if we were going to wow audiences. First, we time remapped the footage with After Effects; two slow cruises became one awesome adrenaline lap with speeds artificially slowing for corners and speed up on straights. We color corrected the footage to compensate for the low flat lighting. This meant keying the sky, car and track and adjusting the colours and levels to produce something bright and energetic. 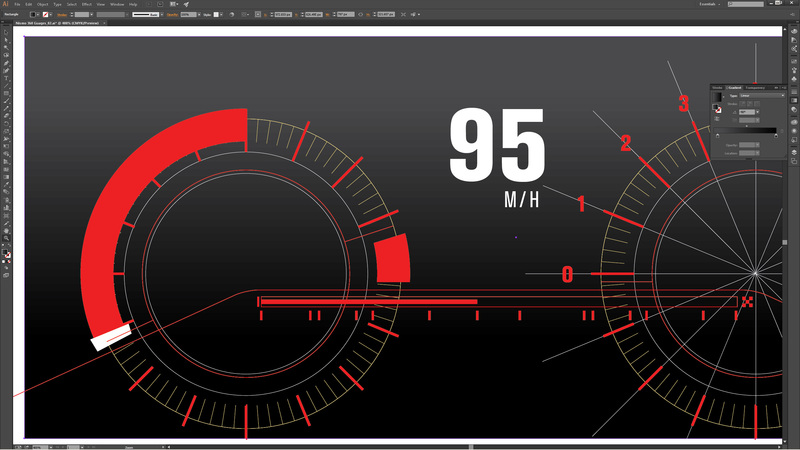 While the 360 video work continued, design began on the HUD and motion graphics introduction. From a creative point of view, we wanted to “teleport” the audience onto the track, almost as if this were all part of a Nissan holographic world. We designed the graphics with Illustrator CC and built out into 2.5D space with After Effects CC. Its important to work in 2.5D space for 360 video because the equirectangular format supported by YouTube is not something you can just drop artwork into. The artist must work in 2.5D space and then convert that out to an equirectangular format. This is where Mettle.com Skybox comes in! 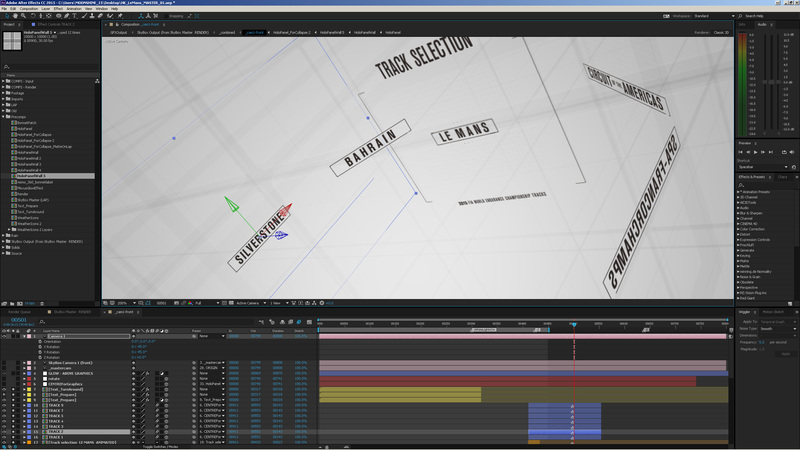 Skybox allows us to convert anything we create in After Effects and map it out into 360 equirectangular space! 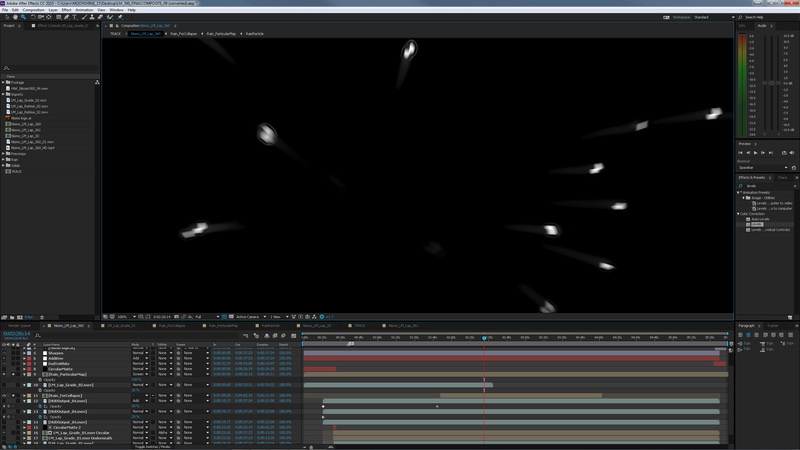 Particles and 3D objects are supported. We also used Skybox to properly align and composite the HUD graphics, we enjoyed compositing their reflection into the car. We needed to cover the camera rig on the hood, this was patched using Video Copilot Element 3D, we used the 360 track footage as an environment to reflect back onto the patch for maximum realism. 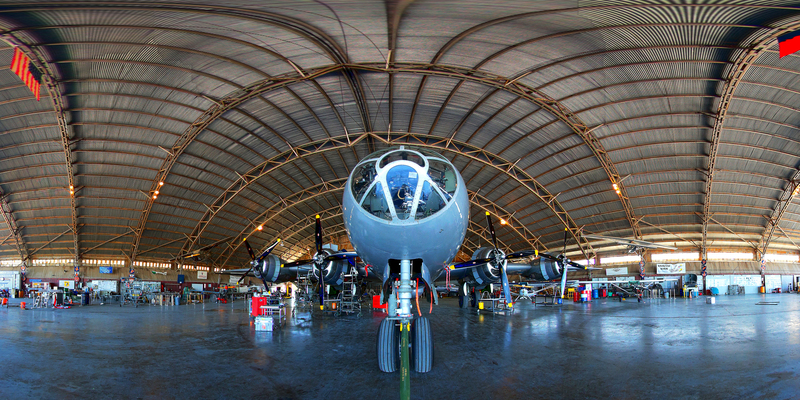 Again this was converted back out to equirectangular space with Skybox. 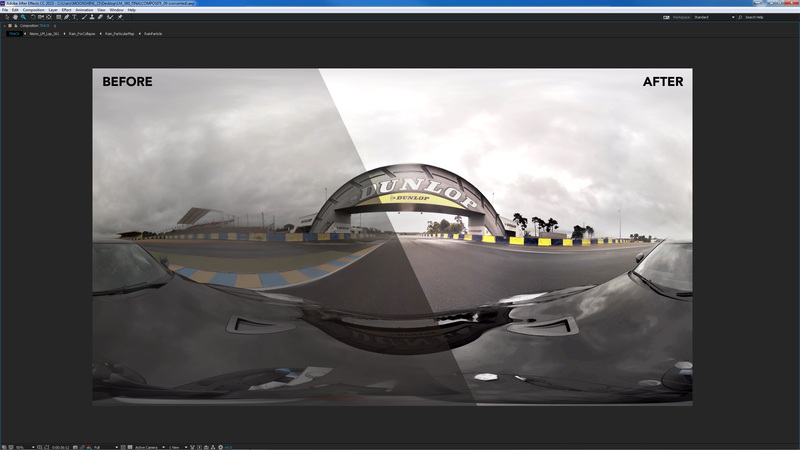 360 video requires large resolution, we rendered at 4k. We prerendered all the elements and assembled into one final composite. The final 4k uncompressed render came out at just over 100GB. Once compressed with Adobe Media Encoder to YouTube’s 4K preset we were down to just 400mb. Overall we turned the post production around in two weeks with just a few hands. Although 360 video has been around for a while, it’s the first time it has seen such a huge audience. Thankfully the tools are coming fast to allow creatives to exploit this new opportunity. 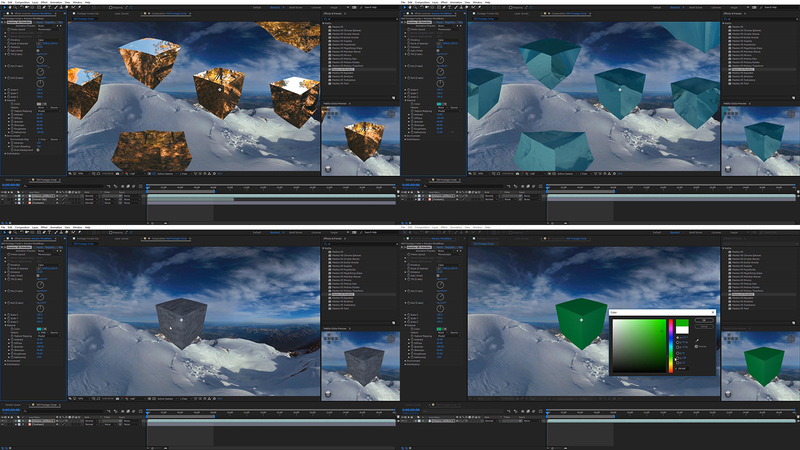 We are fortunate to have been on the beta for the soon-to-be-released SkyBox Studio. It expands on the current SkyBox Creator and Converter functionality and is excellent for use in 360 productions. Watch out for SkyBox Studio, coming soon! 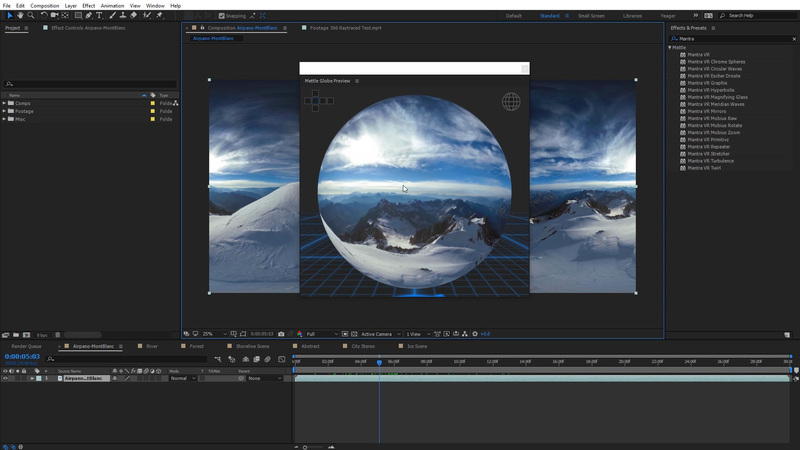 More 360/VR Production Capabilities in After Effects. *Note by mettle: Thanks Ben! Yes – we are about to release SkyBox Studio, which has 2 more modules: SkyBox Extractor and SkyBox Viewer. 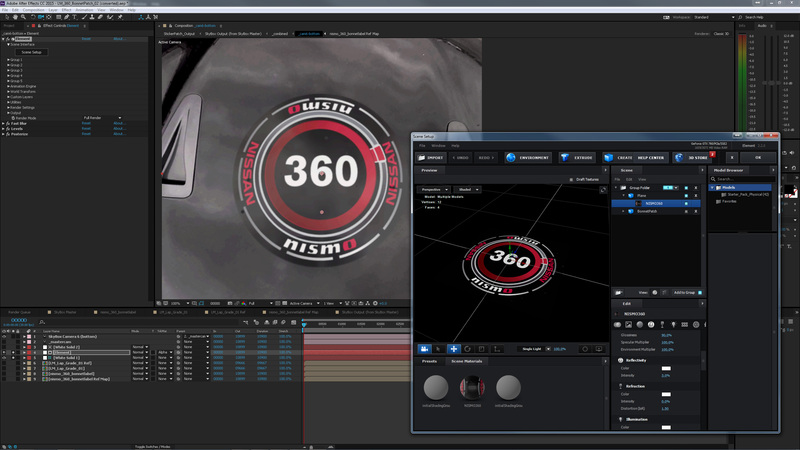 With Extractor, users will be able to easily convert 360 footage back into a “normal” view in After Effects. 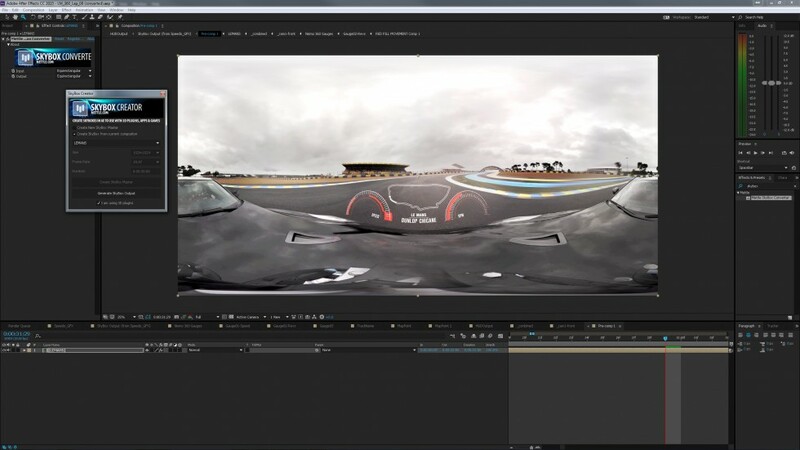 This will be great if you want to add graphics and effects onto your 360 footage. You’ll be able to add what you want to your footage inside After Effects, and then output your comp back to 360 format. 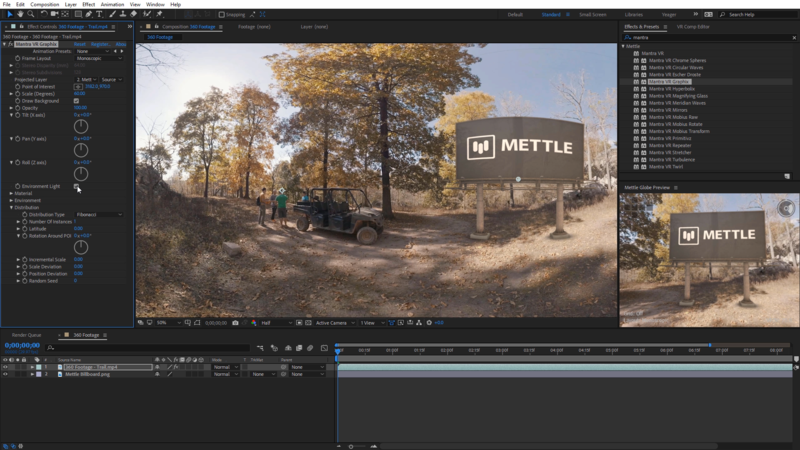 Viewer will let you preview youtube 360 format inside After Effects. Also new – We are about to release an upgrade to SkyBox. On great new feature is Orient Camera > Tilt – Pan – Roll. The amazing part of this is that footage shot with a stationary camera can have camera movements like Tilt, Pan and Roll added in After Effects! We can’t wait to see what is created in the next phase of VR. Thanks to our customers for amazing work. You are inspirational! Hamilton+Kidd is an creative studio based in London. A talented team of artists and technophiles specialising in creating dynamic and engaging content.